I'm sorry. I owe you all a huge venti-sized apology. I was the mom that secretly swore her child would never co-sleep. "No way!" I told myself and my husband. "He has his own room, and he will sleep in there. We will not become one of those families." Yet, since September, our three year old has been sleeping in our room. Every single night. And it probably won't change anytime soon. So, for any co-sleeping parents out there who know what sleep routine works best for them and can't remember the last time their little one spent a full night in their own room, I'm on your side. I am tired of sleep-training. We've been sleep-training for three years. I'm tired of the 2am fights back into the crib. 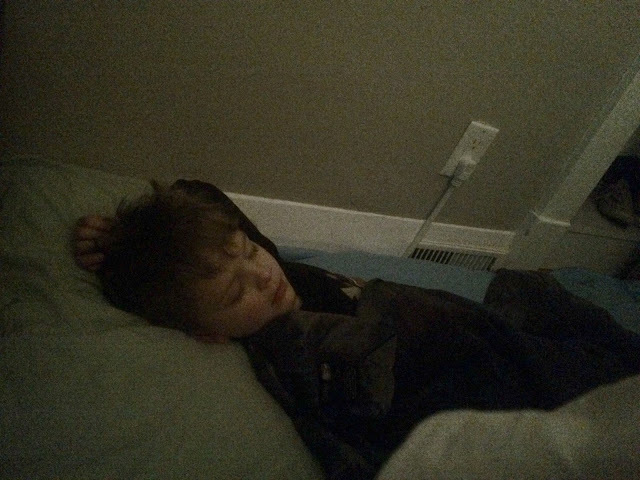 I'm tired of sitting in the chair beside our son's bed and trying to creep away once he falls asleep. A task only made significantly more challenging because of our creaky, 100-year-old floors. We read all the books. We tried sticker charts and bribes. We hired a sleep coach. We cried, we begged, we pleaded. But it's all over. I don't even think Sebastian is really a terrible sleeper. He's had his tricky phases (I blogged about them here and here), and he's had better phases, but I'm just tired of fighting to create those "better" phases. Last September we started a new routine. He had to go to sleep in his own bed, but if he woke in the middle of the night, he could come sleep on, what we call, his "little bed". His "little bed" is basically a yoga mat with a couple of blankets and a pillow. It's right beside the bed where my husband and I sleep in our room. Not one night has gone by where Seb doesn't come into his "little bed". And now, he often wants to sleep there when he falls asleep at night, and we've just let him. We don't usually let him sleep actually in our bed (because no one sleeps when that happens), but he has his space in our room, and he uses it every night. I can easily rub his back or hold his hand or talk to him when he comes into our room and needs a cuddle. Our son needs us in that moment, and I can't turn him away. He falls asleep beside me, and I get to watch him sleep. I get to breathe him in for a few extra minutes of the day. My silver lining to co-sleeping. It is unlikely Sebastian will still be sleeping in his "little bed" when he's 16. I know this is a problem that will eventually have an end, even though it may not always feel like it. There are many battles my husband and I will fight with him, and for these battles we will not be swayed: respect, kindness, compassion. These are non-negotiables. Where exactly he lays his sweet, little blonde head at night, that is something with which I'm no longer willing to be at war.